The video frames in this article are taken from the DoD website in their original size and resolution with no adjustments. This second released video angle gave us the height of the "fuselage". So I found a 757-200 image at approximately the same angle and with the light coming from the same direction as it is in the new video. I matched the fuselage height exactly to the height of the object in the video. That automatically scales the rest of the graphic plane. Here is what the new video should look like then. The first thing that stands out to me is the expected reflections and bright red color. You can clearly see the angle the sun is coming from and the fact that the aircraft would have been completely illuminated by it. You can even see the face of a building behind it reflecting sunlight. 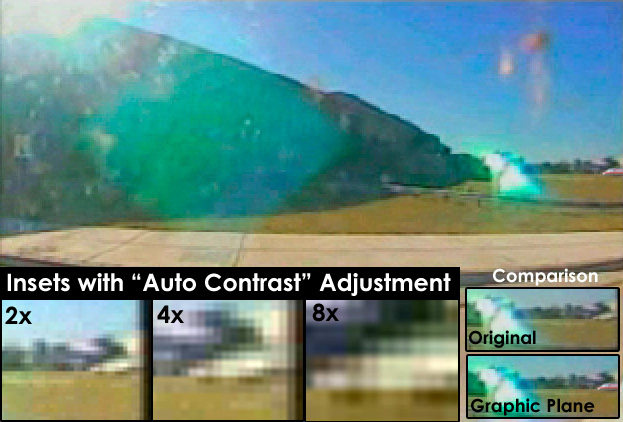 To give an example of the detail this video camera actually captures look at the frame below with a vehicle passing by in the background. I watched it move through a couple of frames and captured a still where it was in line with the object claimed to be the nose of a 757-200. Let's assume this is 15 feet long like the average vehicle (a Jeep Cherokee is 14'). 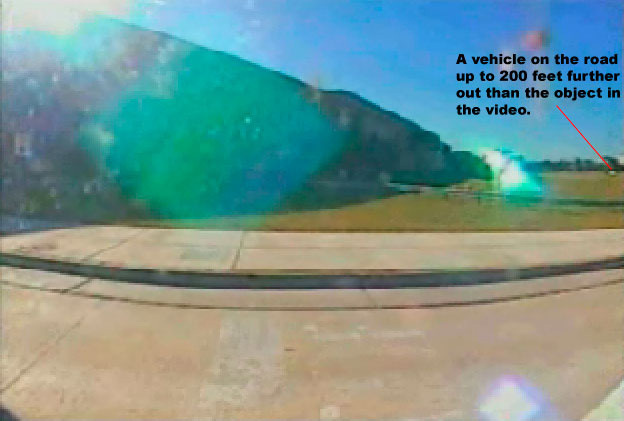 It is an additional 150-200 feet further away from the camera than the object in the video based on the closest possible on-ramp to Washington Blvd.. You can still see the brightness and reflection which we can assume a polished aluminum aircraft would also do. The building reflections are obvious here too. I copied the exact same aircraft that was measured by the height of the "fuselage" in the new video and placed it into the original video frame from the camera that is further back. I slightly reduced the size of the aircraft to make up for the extra camera distance. The interesting thing was that if you lined up the tail height of the graphic aircraft with the "tail" silhouette in the original frame, the graphic aircraft was in the ground and the engines were far below the "vapor trail". So I chose the middle where the two lined up. The other thing I noticed was that the shape of the alleged tail in the original video was quite different than a 757-200 empennage - even if you account for something coming in at a slight angle. What is claimed to be the tail in the original frame does appear to be pretty flush and not at a severe angle though. The one thing we should not underestimate is the difference between a black blob and highly polished aluminum. Even the "vapor trail" is illuminated by the sun. 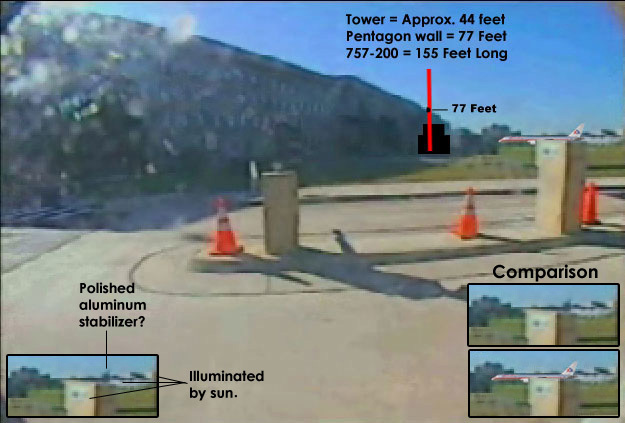 I located the tower exactly using one of the other photos when it was illuminated in the fireball. The tower is reported to be 44 feet tall which is the height of a 757-200 with the gear down within six inches. The Pentagon wall is 77 feet high which is almost exactly half the length of a 757-200 (155 feet). The red line represents the length of the aircraft on a vertical axis. I moved the base of it to the perspective of the wall at the estimated impact point and found where the roof line intersected the middle of the red line and it all worked perfectly as a double-check. If the gear were down on the graphic aircraft it would be a little shorter than the tower which it should be since the impact was behind the tower. Trying to mathematically figure perspective and camera distortion can twist the brain, but if you use known objects in the same vicinity you can get real close. Even if this is off by a few feet you can still see a very different picture than what we have been told. The other point that might be criticized is that the aircraft was reported to have come in at an angle. That might affect length slightly but not the general height of an object. I believe these two sequences of newly released video are authentic. Obviously they didn't fake anything because there is nothing in them of substance. You can see too that the artificial time/date stamp originally on the first five frames when they were "leaked" is not present on the full video sequence. I used to think the frame of the initial explosion in the original video had been artificially lightened, but the blast frame in the new video does the same thing. It may be that the auto-aperture did not have time to adjust. The debris dispersal, the fireball and the smoke progression all correlate perfectly between the two videos even in the anticipated subtle differences since the two videos are slightly out-of-sync chronologically. I measured the time between various events in each of the videos for comparison and they are dead on. For instance, I timed from the explosion up to when the police car was at a certain point on the lawn and everything matches perfectly. It appears that the footage is at 1 frame per second despite what was published about 2 fps. One important thing to note is the debris that rains down in the video. It matches between the two videos in every respect. I also cross-checked some still photos of the area and the debris landings corresponded to where pieces came down in the video to the inch. The temporarily glowing objects in the video were expelled tree branches on fire that can also be seen burned up in still photos of those areas further into the incident. If you look very closely you can see some of the larger debris in the videos that are in later photos further out on the lawn. Fire apparatus would have been arriving shortly after the released video clips end and there is nobody running around "planting" anything. The major pieces we are all familiar with appear instantly. It strikes me that something flew into the Pentagon. I don't know what to say though because it also appears nearly as certain from all of the comparisons that the size, bright color and reflection of the object in the videos does not match what you would expect from a 757-200. I am NOT endorsing a missile or anything else! I am just looking at the physical evidence without a conclusion. It does seem that they do not want us to have any clear picture of what it was exactly.....for now. I think the warnings people have made about a possible booby trap are valid. Don't bite on all of this and go on a tangent. They could pull something solid (or apparently solid) out of the bag and ridicule us later. We should focus on the irrefutable evidence like the demolition of WTC7, the free-fall speed of the towers, Norad, PNAC etc., in other words, things that are WELL documented. The Pentagon situation is always going to be a sticky mess. I think they have made themselves look bad enough without any more help from us.